Together with Francis Crick, Watson was co-discoverer of the double-helix structure of DNA. This they accomplished with the help of earlier research by Rosalind Franklin and Maurice Wilkins. 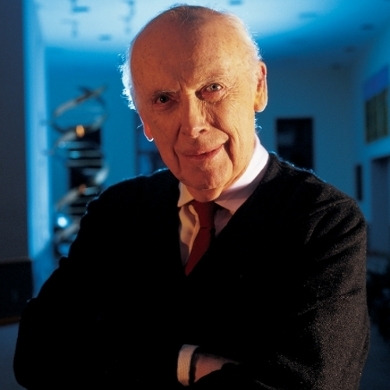 The son of American parents with English, Scottish and Irish roots, James Watson was born in Chicago. One of two children, Watson shared a passion for bird watching with his father, who was a tax-collector. Originally interested in becoming an ornothologist, in 1946 he shifted his ambition to studying genetics when he read Erwin Schrodinger's book 'What Is Life?'. In 1968 he married Elizabeth Lewis with whom he had two sons, one of whom developed schizophrenia. His son's disease awakened Watson's interest in understanding the genetics behind the disease. As a child Watson attended Horace Mann Grammar School and then South Shore High School. When 15 years old he went to the University of Chicago, graduating with a degree in zoology. In 1947 Watson began a doctorate in zoology at Indiana University, where he worked on bacteriophages, viruses that invade bacteria in order to reproduce, as part of research to understand the nature of genetic mutation. Completing his PhD in 1950, Watson then spent a postdoctoral year at Copenhagen University where he continued his study of viruses and started remedying his ignorance of chemistry. In 1951 Watson joined the Medical Research Council Unit at Cavendish Laboratories in Cambridge where several important X-ray crystallographic projects were in progress. Soon he was collaborating with Francis Crick to unravel the structure of DNA. From 1956 he took up several positions at Harvard University and in 1968 became director of the Cold Spring Harbor Laboratory (CSHL), helping it become a leading insitution in genetic research. Between 1988 and 1992 Watson headed the National Center for Human Genome Research at the National Institutes of Health and then returned to CSHL, from which he retired in 2007. Watson is most strongly associated with the determination of the structure of DNA as a double helix, which he published with Crick in 1953. Awarded a Nobel Prize for this work alongside Crick and Maurice Wilkins, this research opened up a new understanding of biology and genetics, laying the foundation for the development of recombinant DNA which helped spawn the new biotechnology industry in the 1970s. Under his watch Cold Spring Habour Laboratory became a leading research centre, not only helping to uncover the molecular nature of cancer but identify cancer genes for the first time.